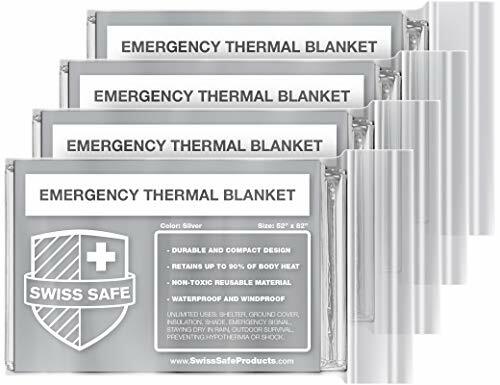 FOUR MYLAR EMERGENCY BLANKETS (Silver) - Advanced dual-sided aluminized mylar blankets. BONUS GOLD SPACE BLANKET - Each package includes ONE EXTRA GOLD colored space blanket. LIGHTWEIGHT AND DURABLE - Military-grade 12-micron aluminized polyethylene mylar, 52"x82" & 2 oz. EMERGENCY USE - Designed to retain up 90% of your body heat, completely block rain, snow, moisture. 100% MONEY BACK GUARANTEE: Swiss Safe Guarantees customer satisfaction or receive a 100% refund.